Dr. Stefan Hofmann is a clinical psychologist at the Department of Psychological and Brain Sciences at Boston University where he directs the Psychotherapy and Emotion Research Laboratory at the Center for Anxiety and Related Disorders. He is one of the foremost experts in Cognitive Behavioral Therapy, especially for anxiety disorders. His research focuses on the mechanism of treatment change, translating discoveries from neuroscience into clinical applications, emotions, and cultural expressions of psychopathology. He is former president of the Association for Behavioral and Cognitive Therapies, and the International Association for Cognitive Psychotherapy. He is also editor in chief of Cognitive Therapy and Researchand is Associate Editor of Clinical Psychological Science. he has published more than 300 scientific articles and authored more than 20 books. 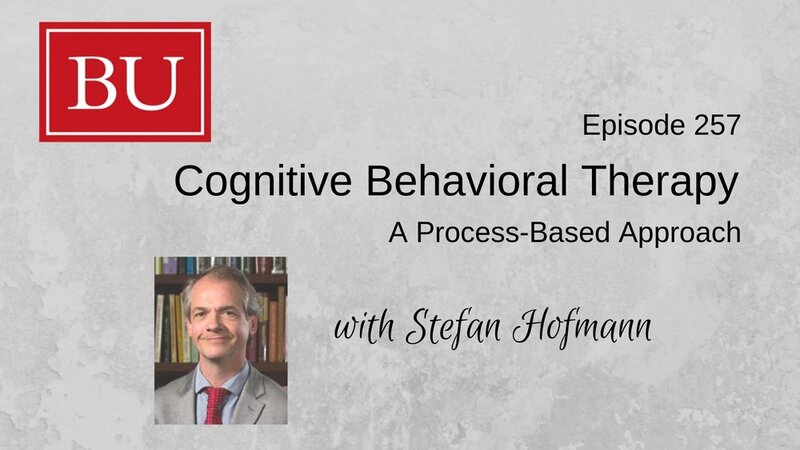 In episode 257 I’m joined today by Dr. Stefan Hofmann, a subject authority on Cognitive Behavioral Therapy and professor at Boston University. He shares a bit about CBT; what it is, how it helps, and to whom it applies. This week on MCF! Dr. Stefan Hofmann is a clinical psychologist at the Department of Psychological and Brain Sciences at Boston University. His study is focused on emotional disorders and working on improving current treatment methods. Dr. Hofmann was born and raised in Germany, migrating to the USA in the ‘90s for his doctorate and post doctoral studies and has been affiliated with Boston University since 1996. He is a trained psychologist in cognitive behavioral therapies and psychophysiology. He is currently working with his colleagues to develop process based therapies. This kind of therapy is in line with precision medicine, where the program of management is more individual based instead of diagnosis based. Their work is based on trying to understand what factors lead to the maintenance of emotional disorders, dissecting the problem into meaningful chunks and targeting the sub-problems instead of the latent disease label. Dr. Hoffmann states that for years researchers have been focused on finding biomedical markers for the latent disease but unable to determine anything. He and his colleague Steve, believe that the inability to find the markers is because of their nonexistence and the flawed idea of latent disease process. His belief is that the symptoms are inter-connected and maintain the problem of emotional disorder. It is important to understand the connection and then interfere to break the circle of maladaptive network. The bottom-line is, if we understand what maintains the problem, only then will we be able to introduce a different behavior to break and change the cycle. CBT originated in 70s-80’s by Aaron T. Beck who was a trained psychoanalyst, when he realized that there were errors in thinking while managing depressed individuals. The idea was that people with disorders like depression, anxiety, schizophrenia and likes have impaired cognitive beliefs that give rise to maladaptive thinking patterns. Hence, management is focused on identifying those thought processes and thinking patterns and challenging them for their validity. Treatment interventions in CBT include behavioral experiments; which involves patients to test their negative predictions in the real world.